You are here: Home / Tax Planning / How Income Tax Department tracks the High Value Financial Transactions? How Income Tax Department tracks the High Value Financial Transactions? In my previous post, I have written about e-sahyog, an online facility provided by the Income Tax department for resolving mismatches with respect to Income Tax Returns. How the Income Tax department receives this information? Who provides this information to the IT department? What are the incomes that are reported to the IT department? What is the list of high value financial transactions that are reported to the department? How to check if your high value financial transaction(s) are reported to Tax department? With an aim to curb black money mess and to track high value cash transactions, the government has decided to implement new reporting guidelines w.e.f November, 2016 & March 2017. As per the govt’s notification, all goods & services providers have to report to the IT department about high value cash transactions & cash receipts. Under the new norms, cash receipts, purchase of shares, mutual funds, immovable property, term deposits, sale of foreign currency will have to be reported to the tax authorities in a prescribed format, which is Form 61A. Immovable Property : The Registrar of properties will have to report purchase & sale of all immovable property exceeding Rs 30 Lakh to the Income Tax authorities. Professionals : The Professionals will be required to inform the tax department of receipt of cash payment exceeding Rs 2 lakh for sale of any goods or services. Cash Deposits in Banks : Banks will have to report cash deposits aggregating Rs 10 lakh or more in a financial year in one or more accounts (other than Current Account / Time Deposit) of a person. Term Deposits in Banks : Banks will have to report cash deposits aggregating Rs 10 lakh or more in a financial year in one or more Time Deposit accounts of a person (other than a time deposit made through renewal of another time deposit). These norms will also cover deposits and withdrawal made in Post Office Account. Deposits in Current Accounts : Cash deposits or withdrawals aggregating to Rs 50 lakh or more in a financial year in one or more Current Account of a person will have to be reported by the bank to the I-T authorities. Any cash payment of Rs 10 lakh or more in a financial year for purchase of bank drafts or pre-paid instrument issued by RBI will also be reported. Investments in Financial Securities : A company has to report receipt of Rs 10 lakh or more from a person/an investor in a financial year for acquiring bonds, debentures, shares or mutual funds (other than the amount received on account of transfer from one scheme to another scheme of that Mutual Fund). (ii) Rs 2.5 Lakh or more, in one or more accounts (other than a current account) of a person. In addition to the above list, quoting your PAN is now mandatory for many financial transactions. Based on this data also the IT department can track your financial transactions. Banks – They report High Value transactions related to deposits credit card payments. Sub-Registrar offices on real-estate deals. How do third parties report? To keep a watch on high-value transactions by tax payers, the I-T department has developed a statement of financial transactions called Annual Information Return (AIR). On its basis, tax authorities will collect information on suspected high value transactions during a year. Also, it is mandatory that all the specified entities (third parties) to furnish an AIR in respect of specified financial transactions registered or recorded by them during the Financial Year. All the above third party establishments have your PAN details and they quote PAN details of all the high value financial transactions recorded by them in AIR. They submit AIR to the income tax authority. In which report can I trace the High Value Financial Transactions? You can check your Form 26AS under AIR section if any investment or expense has been categorized as a high value transaction. You can find high value financial transaction details under PART-E of your Form 26AS. Click here to access your Form 26AS. For example – In the below image you can find that Just Dial company has filed AIR with the IT department indicating that the concerned Tax Assessee has purchased their equity shares worth more than Rs 1 Lakh during the Financial Year. How to respond to the notices related to Non-Pan Transactions online? In case if the Tax department finds discrepancies related to your high value transactions Vs your income tax return (or) if you have not quoted your PAN where it is required then they can issue non-PAN transaction related notices to you. The notice contains details of the high value transaction and requests you to disclose if you own such transactions. The notice contains unique Transaction Sequence number (TSN) based on which you can respond to the non-PAN transaction notice online, on e-filing web-portal. Visit and login to e-filing portal. Click on ‘Compliance’ menu option. Click on ‘Non-PAN transaction’ option. Key in your TSN (Transaction sequence number) in the ‘text box’ and click on ‘search’. You can view the details related to your high-value non-pan transactions. Click on ‘submit to view further details’ button. Purchase of Mutual Fund is out of sources disclosed in the Income Tax Return. Part of the purchase of Mutual Fund is out of sources disclosed in the Income Tax Return. No such transaction was conducted. Want to avail the benefit of Income Disclosure Scheme, 2016. More time needed to submit response. You have to select one of the listed options and click on ‘submit’ button. You can view your response(s) by visiting ‘view response to non-pan transactions’ link under ‘Compliance’ menu option. You also have the option to revise your response. How to reply to the notices related to High Value Cash Transactions online? Click on ‘Accounts with Cash Transactions. You can click on ‘Submit’ button to provide your response. Transactions in the account are considered in IT Return. Transactions in the account are considered in IT Return of another Account holder (joint-account). Transactions in the account are not considered in IT Return. Transactions in the account are partly considered in IT Return. No relation with the Account. You also have the option to ‘revise’ your response after submitting it (if required). Also, if you have made Cash deposits during 9th Nov, 2016 to 30th Dec, 2016, it is advisable to check the Compliance Section of your Income Tax e-Filing account. If cash deposits are not in line with Tax-payer profile, such data is shown under Compliance section and concerned individual has to submit his/her response to such discrepancies. 1 – Visit Income Tax e-Filing Portal. You may also receive an Email / SMS (if registered on e-Filing portal) from the dept, regarding Compliance notice (if any). How to avoid receiving Income Tax notices on High Value Financial Transactions? According to the Income Tax Authorities, transactions worth around Rs 12,000 crore form part of the Suspicious Transaction Report (STR) 2014-15, which is under probe. It is often observed that many tax Assessees try to avoid showing their sources of income or tend to show less income in ITR to reduce their income tax liability. But, they do not know the fact that the IT dept might have complete knowledge about their financial transactions. Therefore, it is better to declare all your sources of income and investments properly while filing your income tax return. Else, it may lead to adverse consequences. It is always better to file your ITR before the due date. Cross check all the TDS entries in your From 26AS. You may repeat this exercise once in a quarter. 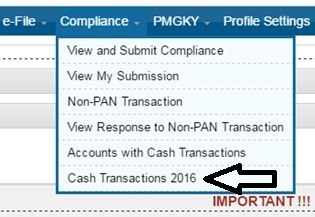 Check your Form 26AS if any transactions are reported under AIR section. Keep your PAN details up to date. Disclose the entire and correct income earned by you during the FY in your ITR. Suggest you to kindly consult a CA. Hi Sreekant, please help with this query. My relative from US is here to sell her property, unfortunately, she does not have a PAN Card. SO can I take that amount approx 60 Lacs in my account and then transfer to her US account? Is it illegal? May I know if she is an NRI? Kindly note that it is compulsory to have PAN card while buying or selling a flat. However, it is not mandatory for an NRI / PIO to have a PAN for entering into a property transaction. But, PAN is required to repatriate the sale proceeds of the property. If you are not a Party to the deal, suggest you to avoid accepting the proceeds into your account. Kindly consult a CA. Why is the refund process so late for 2018-19? My E-verification was accepted on July 10th 2018 and not yet processed.I still see the status as E-verification accepted. Can you pls tell me if there is anything I need to check? In my case as well (ITR-3), the Tax return was filed in July, got the Notification that it has been processed in this month (Feb), it is a No-Refund case though. Looks like the IT dept has been slow this AY in processing the ITRs. But, generally they process Refund cases faster comparatively, as they have to pay interest on refunds. Kindly check if your registered email-Id inbox, in case, you have received any intimation.. I have received the Intimation email/SMS that ITR has been processed. And after few days, the status of ITR on e-filing portal has been changed to ‘ITR processing completed’. All this happened in this month (feb). Ok thanks again for the reply.. highly appreciate your time and quick responses..
Hi, just to update that still waiting for the refund, is there anything else I should wait for or is there any more process? I thought that the refund is followed by e-verification acceptance..atleast I should get some status other than e-verification accepted..or would there be any error in my filings? If there is any discrepancy in your return, you will get an intimation from the IT dept once your ITR gets processed. You may kindly wait for few more days..
You can submit your grievance to them via e-Nivaran link..
Also if some one receives a high value in bank account through NEFT from maternal uncle i.e., mothers brother, or from parents and the receiver is major then if the receiver invests in mutual funds net amount more than 10 Lakhs, then the income earned from the receiver will be considered the income of maternal uncle or parents as they gifted? Also will the amount receiver, receives a notice an IT NOTICE? If one mentions this as gift in ITR, then also IT department may try to know the details of this notice. What can be done not to get any notice? In the said scenario, the tax assessee can disclose the Gift as an Exempt income under the Exempt income section of Income Tax Return. Yes, even after disclosing it, the IT dept can still issue the notice to know more details of the transaction..
Hi, I want to purchase a property on my name which is 35 lakh for that i have 15 lakh from my job savings and my friend helps me for the rest amount 20 lakh by cheque/ online transfer just to avoid interest on loan. Please suggest if there is any tax liability on this 20 lakh on my savings account, and the way how can i exempt from tax liability. i wish to pay him with monthly installments of 20000 per month. You can consider it as a Loan from Friend. You can even claim tax exemption (u/s 24) on this which is similar to home loan taken from a financial institution. I have credited rs. 1000000 as A personal loan in my salary account from the sbi do I need to pay tax for the same?? Personal loans are not considered as a part of income so while filling for IT returns the loan amount is not going to be considered as taxable fund. You have posted an excellent and very well written article. Can you please summaries below points on bank transactions for me? 1. How much amount one can DEPOSIT in his Savings account, by Cash, in a Financial Year? 2. How much amount one can DEPOSIT in his Savings account, by Cheque / Online Transfer, in a Financial Year? 3. How much amount one can WITHDRAW from his Savings account, by Cash, in a Financial Year? 4. How much amount one can WITHDRAW from his Savings account, by Cheque / Online Bank Transfer, in a Financial Year? 5. What is the Daily limit on Cash DEPOSIT in a Savings Account? 6. What is the Daily limit on Cash WITHDRAWAL from a Savings Account? 7. What is the Maximum amount of Fixed / Term Deposit (FD) one can create cumulatively in a Financial Year? Though you have already answered some of the questions in the post, but please summarize it for once and all. Thank you again. 1 – Upto Rs 2 Lakhs. 5 – No threshold limit but can be subject to point 1 and bank may ask for documentary evidence. 6 – No threshold limit but banks may have their own internal limitations. Thank you again. Sorry, but your responses confused me a bit. Point # 1 & 3: I asked “How much amount one can DEPOSIT in his Savings account, by Cash, in a Financial Year?”. You mentioned it is up to Rs. 2 Lakhs. However, based on the article (link you shared), that limit is for a single day or event/occasion. It is not for entire financial year. As per my knowledge the limit is “10 Lakhs” in a year (whether its cash, cheque and online mode), over and above which the banks/financial institutes reports that account to IT Dept. I am not sure if they do the same for WITHDRAWAL of 10 Lakhs and above from same savings account. Point # 2: I agree with you. Point # 4: I agree with you. Point # 5: I agree with you. Point # 6: I am not sure. Its bit weird that they put restrictions on deposit of cash above Rs 2 Lakhs, but allows withdrawal above it, without any constraint. Point # 7: Again the limit is “10 Lakhs” for FDs cumulatively by the account holder in a Financial year, over and above which they are reported by banks/financial institutes to IT Dept. and are reflected as AIR transactions in Form 26AS. Please confirm my understandings. Sorry, I had gone outstation and could not respond you early. I have provided my answers from banking customer viewpoint and not on AIR (banker’s compliance). How much amount one can DEPOSIT in his Savings account, by Cash, in a Financial Year? – I can deposit any amount of cash if I have genuine documentary evidence. But, the bank may report the high value transactions to the IT dept. Both are two different things. Hope you get my point! Sir , I got a notice from Citibank on closure of my account in 30 days for which they have not given me any reason. I have around 10 lakh in my account which I have earned and save s from my previous jobs and also paid tax also. Currently I m not working after marraige. So now if I transfer my own money to my other account , would it come under tax scrutiny or I need to answer ITD queries on the same. Please help. As the corpus is from your earned income, there is nothing to worry about.. Suggest you to transfer the funds from Citi to your other bank account through Cheque or Net banking mode. Keep the bank statements of both accounts after the transfer for your future reference. Sir I am Salary person and there is income tax refund of Rs 25k . for crediting income tax refund i give other bank details which is non operating from last 3 years. can bank ask the question to me when i withdrawal the same refund ? Dear SACHIN ..No questions will be asked by your banker! Kindly do not believe these kind of bogus offers. Stay away from doing any transactions and ignore such calls. Do not share your bank a/c information. My wife got a notice from IT dept regarding high value transaction carried out during 2014-15. As she is a housewife and doesn’t have any regular source of income she is not filing any returns. The high value transaction ie deposit above 10 lakhs is from her parental side upon sale of ancestral property. Did she sell the house or Dis she receive a Gift (amount)? I believe she can respond by selecting options ‘Self & Income from transaction is exempt’ (or) ‘Self & Investment/ expenditure is out of gifts/ loans from others’. You may also consult a CA and reply to the notice. I heard that state government or central government employee can not allowed to trade or invest in equity/share market.can this is true? It is not true dear Bala..
Dear Reddy sir I have a query: I planning to sell my flat to a buyer & this buyer gives me total amount by cheque but he wants to register this flat on his relatives name. So can this transaction creates any problem for me in future as I received cheque from person A and flat transferred​ to person B.
Dear Bala ..Advisable not to enter into such transactions..can be very risky.. Your advices and suggestions are very helpful. Keep up the good work and thanks for sharing your expertise. My Q: I gave advance for buying a land for 18 lakh rupees in Oct 2015 through a single cheque and the deal did not go through but the amount remained with the seller. On asking for return, it took him almost till now. Now he is ready to return it again in form of cheque. I am an IT guy, I have all my earnings through salary either in USA or in India. 1. Will I have any complications with income tax folks if I take a single cheque of 18 lac and deposit it in my account? 2. Should I ask him for multiple cheques? If yes, what denominations? 3. Should I ask him to keep the cheques name blank and then I can deposit in multiple accounts and then transfer it? 1 & 2 – As both the transactions are through Cheque modes, there should not be any issues. Keep a copy of Sale agreement for future reference. Even if you get a compliance notice, you can justify this..
3 – All accounts are now linked with PAN. Thanks a lot for your prompt response. Will do as suggested. I was NRI until 1.5 yrs ago. since i returned to India my income has been only from the rent of 2nd property. 1. My credit card expenses has been around Rs. 2 lac. as against income of Rs 5 lac. 2. I have made few overseas trips for new job. some paid by employer and some by my personal savings. Are the above scenario questionable by the IT man? Looks like your purchases are genuine. This is unique and in-depth information you are sharing related to the tracking of a financial transaction by the income tax department.Kindly check our portal http://www.trutax.in/ which is a portal for filing the income tax returns online.It is a unique technology-driven platform for filing income tax returns online. I have 6 credit cards with 25 lakh limit. And my friends doing online retailing business. my friend used my cards and earn profit to buy goods from dealers and sale it online and he pay some fixed interest in every month to me and every month some time he pay my credit card bill payment. some time he transfer online money to me for pay credit card bill payment. And from earning interest from my friends side i have paid INCOME TAX on these income timely to tax department online. Now we have convert all credit cards outstanding in emi. and paying timely. Advisable not to repeat this again. Suggest you to consult a CA and get advice. First of all, I want to say that I really appreciate the valuable information you share. I have some queries and I hope you would help me. 1. I am a educational blogger and earn 12-13 lakh a year by sell study material through my site. All this amount comes to my current account through PayPal. But I don’t withdraw or spend money from current account directly. Instead I transfer money to my saving account and pay to people (business as well as personal expenses) from there. So the saving accounts also has a transaction of 12-13 lakh in a year. Is it a bad practice snd can it cause any problem? 2. I am still confused whether selling study material (eBooks and videos) will be considered sell or service. I have registered for service tax but have been filing zero return as I saw that service provided to foreign clients doesn’t attract service tax. More than 95% of my customers are from other countries. In that situation what taxes am I liable to? 3. I don’t keep any separate record of income and expenses (most of which are through bank so they are there in the statement). Do I need to keep any separate books of accounts? If yes, how should I keep them? I pay rent, vehicle expenses and also to service providers and most of the time I don’t get any specific receipt. How do I keep record of these expense payments? I know it’s too many questions but I have asked these questions to so many people and no one has given satisfactory answers. I would really appreciate if you could help me. Thank you. 1 – Should n’t be any issue..
2 – It may fall under selling of goods only and not a service. Service tax is not applicable in your case as I believe that you are getting the money converted through foreign exchange route. Only Income tax is applicable. 3 – Kindly consult a CA. Thanks a lot for responding. I understand what you mean by “getting the money converted through foreign exchange route”. Customers pay with their cards in Dollar through Paypal and another Payment gateway. And PayPal and the other payment gateway sends me the money in Rs (after conversion) through NEFT. Dear Divesh ..Your understanding is correct. I want to transfer money to my grandmother savings account so she can open a fixed deposit worth Rs.2500000 in her name. I am transfering the said 2500000 through cheque and NEFT. Will it be repoted to IT department under AIR under her PAN details that she received money through cheque and neft/rtgs? She has never filed her IT as she is houselady. Can she file 15H in order to avoid TDS. She is 80 years old with no investments. Does she need to file IT return after making fixed deposit? Her only income source shall be fixed deposit having interest aprox 2.5 lakhs a year. I LIKE YOUR ARTICLES AS COMPARED TO OTHERS. KEEP WRITING!!!! Yes, can be reported. (or) She may receive a compliance notice asking for ‘Source of Funds’ for such deposit (or) about Non-Filing of Income tax return. Kindly note that interest income from FD is taxable. No TDS , does not mean, no Tax liability. Do I need to file my ITR? Gone through both of your articles. The source of fund is gift from grandson to grandmother. I have already paid tax on 2500000. She is super senior citizen and I think the interest earned per year would be less than 3 Lakhs. She don’t have another source of income. Will it be ok if she files 15H to avoid TDS.? Yes, no tax implications on Gift. But the IT dept may not know it as a Gift. So, your grandmother can file ITR (though there is no tax liability), and can disclose this Gift amount under ‘Exempt Income’ section of ITR. Which type of ITR form is used for this purpose? What kind of information is seeked under exempt income apart from gift amout for this case? The type of ITR depends on source(s) of income and other factors. Read: Which ITR form to file? u r services to be treated as doc, to needy patiant. pl. keep on. i used to file my IT RETURNS promptly untill i in service. which are LESS THAN THREE LAKHS, in any year. Kindly read this article, can be useful to you : Do I need to file Income Tax Return? my father is a farmer and he had given an amount of 4 lacs to his friend by cash in aug 2013 at 24% per year and he repaid total 6 lacs through cheque transfer to my account in the aug 2015 as my father doesnot have pan card.whether i have to pay tax on it or what explanation should i have to give about the source of money. Did you file income tax return for FY 2015-16? can i give gift to mother more than 25 Lacs. of each year . then it become a question from IT department for me. ? second thing my mother who has file the IT return and disclose the only interest earning on Fixed deposite from bank. its required to tax free income shown of gift ? Gifts in this case are tax-free. Kindly gift the amount through online transfer / Account payee check only. Rs 2 Lakh Cash Transaction limit w.e.f. April 2017. Gifts & income tax implications. She can disclose the Gift amount under ‘Exempt income’ section of ITR. I have certain doubts about bank transactions. I understand cash aggregating to Rs 10 Lakh p.a. is deposited in SB A/c attract income tax. But how do i calculate the total deposited cash in my bank account? Say i deposit an outside cheque in my SB account amounting Rs.15,000 but the cheque bounces. My bank statement reads cheque deposited Cr. 15,000 and cheque return Dr.15,000 + bouncing charges. The fact is i didn’t actually got the money but my credit total of the month adds that 15,000 up with the rest which makes up a huge number. My doubt is, such defaults would be counted as deposits? or only those amount that were actually credited to my account. Reversal of transactions are not counted. As long as the transactions are properly accounted for, there is nothing to worry about. Kindly note that cheque transactions are not ‘cash’ mode transactions. Thankyou for the information provided. So its only physical cash deposits. Sir, what about electronic/cheque mode transactions? Will those be informed to IT dept. for exceeding certain limit? I have a new bank account for 8 months with transactions (mostly electronic/cheque mode) exceeding 60K average. My relative informed me that i cannot file IT this financial year as my account is short of 12 months. I was told to file IT next year. Is it true? I am new to this whole tax thing so i am just trying to figure things out. Kindly note that as long as you file your taxes disclosing all sorts of income, expenses and investments; kindly do not worry about any of these limits. Read: Do I need to file my Income tax return? Dear Ankit..Not required to show purchases.. I am an NRI, holding a NRE Account in Central Bank of India. The cash transaction activities were exceeding Rs 10,00,000/- in a month for the year 2014-2015 as these cash withdrawal were relating to day to day expenses for my family, medical expenses for my family as my father being a heart, BP and sugar patient, house renovation, children education fees, Utilities bills etc. Could you please let me know what option i should choose while responding thru efiling? May I know if you have filed your Income Tax return for the said FY? Kindly read: Compliance Notice & how to respond? 1. if my Fixed Deposit interest earning for the financial year is more than 10 Lacs, do i be liable to pay service tax? 2. If the building and lodging rent income and FD interest Income is more than 30 Lacs, What is the mode of Tax payment? What are the parameters i can show to reduce my tax payment ? Such as Yearly Expenses , LIC and what else? 3. Is the Tax slabs calculated after deducting the expenses from the total income of the financial year or the Tax slabs are directly calculated of the Total Income? Thanks. Would appreciate your response. 2 – Kindly consult a CA. 3 – After accounting for applicable expenses..
10 lakhs deposit in a single bank account or many bank accounts? Also does IT department look at old transaction done in say 2012-13 and 13-14 now too? and we may get a notice? Very nice & informative article.Please keep it up……. Dear Rajeev..I dint get you…’up to which date’ means?? If you sell a property in FY 2016-17, you have to include the details of the transaction when you file your income tax return for the Assessment year 2017-18 (ie before july 2017). I am a private employee and have 4 credit cards with limit of ~3.3 lakhs in total and recently used these cards online for purchase of goods (grocery) for my bro-in-law shop for an approx. value of 3 lakhs and he is paying back the transaction amount through a cheque before the due date of credit card payment and I’m depositing some of the cheques in my account and few in my spouse account and paying back the credit card bills before the due date. I’m in 30% tax bracket and my spouse is a home maker and has PAN (over an year or 2) but never filed return. What is the best way to show / avoid in returns? Better & advisable not to repeat these kind of transactions. Do you mean to say that he has paid entire Sale value but the registration has not been done? I am bit confused here…kindly rephrase your query???? I can sense that your builder might be playing a GAME here. You may do the registration for vacant plot only, else you may end up paying huge taxes if you register plot+house to another person. Dear KUMAR ..He pay taxes, but can you be able to justify that you have the required sources of funds to complete the construction? It can be a risky affair. Dear kumar ..If you have necessary source of funds and is ready to pay tax on Long term capital gains (plot + house) received through sale proceeds, it should be fine i guess. Kindly consult a Chartered Accountant if possible. Hi Sreekanth I am resident Indian and my wife is NRI working in UAE. I bought shares of Rs 850,000 since April 2016 in different companies amount not exceeding rs 90,000 in one company. I received all this money as remittance from my wife and some transferred from my brother-in-laws’ NRI account through NEFT. If I invest more than rs 10 lakhs in shares within one financial year will it get reported as high value transactions? If I buy shares of more than rs 1 lakh in one company will it get reported to income tax dept? My wife wants to transfer rs. 25 lakhs from her NRI account can I invest it in shares? will I get any notice from income tax or will there be any legal issues? I don’t pay any tax and my source of income is agricultural only. Kindly note that it is Rs 10 Lakh in one company’s Shares. So, this part is ok. But if you receive monies from your wife, advisable to disclose these as GIFTs in your income tax return. You may choose to remain invested in equities for atleast an year, so that the gains on Stocks (if redeemed) are tax-exempt. As you don’t file ITR and if you receive huge sums of monies, you may get Compliance notice for Non-Filing of ITR, and you may have to justify your stand. Thanks for your reply. So what I understand is if I my investment crosses 10 lakhs in total also it will not get reported as high value transactions if it is below 10 lakhs in one company. By the way, I am investing since last 3 years and I have not sold single shares till date. What would be the scenario if I buy agricultural property by the money my wife transfers from her NRI account? Is it legally allowed? As I understand my wife as a NRI cannot buy agricultural land in her name. Buying agricultural land is subject to certain Terms & conditions, these are primarily vary from State to State. For ex: in some states, non-agriculturalists can not buy an agricultural land. Also, there can be certain threshold limits w.r.t. income of the family, to buy agri land. So, suggest you to consult a CA/lawyer before taking decision regarding this. My father is a retired government person having income from pension only less than basic IT slab.He purchased a 1 BHK flat in Jan 2012 whose registered value was Rs.12 Lac & planning to sell this in Jan 2017 at registered value Rs 30 Lac. He wants to gift all this money (Rs 30 Lac) to me OR my wife. Note: I am in 10% I TAx slab bracket & my wife is house wife & both of we are planning to invest all this money (Rs 30 Lac) in share market for long term. Kindly advise the best way to minimize any Taxes for both My father as well as Me OR my wife. Can I create registered value of this deed Rs 12 Lac (same as purchased price) & take Rs 18 Lac directly from new owner to my OR my wife’s account as gift. If your father gifts amount to his Daughter in law then ‘clubbing of income’ provision will come into picture. However, if she invests in stock market and remain invested for >1 year then any gains on such income is tax-exempt. If any taxable income, then your father has to pay the taxes as the taxable income is clubbed to his income. This is not the case if he gifts the amount to you. You can re-invest the gifted amount and if any taxable income is generated on this corpus, it is clubbed to your income only. Kindly read: Gifts & Income tax implications! Till the time she owns it and she gets taxable income on the property. 1) It means that my wife doesn’t need to file ITR even though she earn taxable income on gifted amount right? 2) Only may father has to file ITR & pay tax (only if she earn taxable income on gifted amount) right? 1 – Advisable to file ITR and disclose the gift money in ‘Exempt Income’ section to avoid any issues in future. With reference to the above mentioned subject, I am Gopalakrishna from Hyderabad and I have the following query. I recently got a student visa to study in new Zealand, but due some family issues I want to withdraw my application for which I will get my funds back, it is around 28 lakh INR. 16 lakh will be received by the university and 12 lakh will be received by ANZ bank, newzealand. Actually, my father is the financial supporter for me, so majority of the funds were transferred from my father’s account and remaining was from my account as educational loan. Unfortunately, ANZ bank is asking my account number to transfer back 12 lakh, they are not accepting my father’s account for refund. Now, my question is if it will be a problem as per the new rules by PM Modi.?? I don’t have any IT returns filed, but my father has 18 lakh return. I am much worried about this, please help me out and also provide your contact details. It may be advisable to consider this as Loan amount (interest-free loan taken from your father) and you are now repaying the amount as you are getting back the refund (assuming that these amounts have been properly accounted for by your father & these transactions are done through banking channel and not through cash). You may consult a CA and check if any loan agreement has to be prepared for and how to file Income tax return in this scenario (by you & your father). I owed a Individual house for 5 years from 2011and I sold it on Dec 2016… Hope I need to pay Capital Gains Tax for my sold property.. How long is the grace period to pay the tax and could you pls guide me where to invest the money to avoid paying tax. Kindly read: How to save Capital gain tax on sale of house property? My father expired two months back at the age of 87yrs..He has bank deposits worth30 lakh for which I am the nominee.If I transfer it now, the sudden influx will attract un necessary questions,Im too worried…Shall i wait till Jan. Considering what is happening right now, advisable to do it in next month. But kindly note that the inherited amount is tax-free in your hands. Once the deposits are in your name, the interest income if any on deposits is a taxable income. I am NRI, if i do online transfer to my father account, Will we get any notice from IT? What is the limit of transfer? These transactions can be treated as Gifts. However, advisable that your father discloses the amount as Exempt income when filing his income tax return. I believe that If an individual is an US based NRI, will have to report the gift to IRS if amount per donee per financial year exceeds USD 14,000. Dear Vinoth ..the details are as per your PAN application.. The details of PAN are picked up from a different database maintained by NSDL. So, if you need to change the name entry, you can apply for that online through NSDL portal. Dear Vinoth..I am unable to understand your query..kindly rephrase it.. In case, your PAN has wrong details you can submit application for ‘Name correction’ for the same PAN number. You have to submit necessary document proofs regarding this. What happened If I not pay any Capital gain tax on sale of property? How much penalty will applied if got in scrutiny of IT dept.? Dear Ravi..Why would you not like to pay the taxes? i hd taken loan more than 2.5 lakh from bank and i submitted loaned amount to bank acnt on my pan, then i hv to clerify on this? another que; i had borrowed 2 lakh rupees from my 1 friend by online transcation within last 3 years. now i have approx 2 lakh rupees and if i submit it on my acnt and then i transfer her those 2 lakh ruppee by check. then is it okay to do? can i submit aGain to pay my frnd to whom i borroewd money? or i hv to clerify abt this amount. 1 & 2 – As long as these are online transfers or cheque payments, kindly do not worry. in 2013-14 my company had duducted tds from my salary but i hd not filed it return fpr 2014-15 bcs of lack of awareness. now can i filed it for 2014-15? my secnd quary: i hv given my frnd about 1.5 lakh rupees year. does it meant that my white money amount is 1.5 lakh less? You can not file FY 2013-14 returns now. In one financial year you can file your IT Returns for previous 2 financial years. For example – in the FY 2016-17, up till 31st March 2017, you can file return for the previous 2 financial years 2015-16 and 2014-15. We are HUF and have pan card in name of HUF and current account in the name of HUF. Banks have taken my pancard and my sons pan card for purpose of Authorized Signatory / karta and mapped to the HUF current account. “with Substantial Cash Transaction” in individual accounts as it was mapped to HUF current account. Plz help me what to reply for this response. Can i reply that Transaction in the account are considered in return of other account ? Dear ravi ..Suggest you to kindly consult a Chartered Accountant in person and take help. Hi – is it mandatory to declare cash withdrawal as well? I have withdrawn some good amount more than 10 lakhs from my personal NRE/NRO account for personal and other expenses, wondering whether I should show the proof on those expenses? Please advise. Btw, this was before 8th November. Is cheque deposit considered as cash deposit? Does 2.5 lakh limit includes cheque deposit and online transfers? Dear Sendhil ..No, they aren’t considered as Cash Deposits. Are NEFTS considered as cash deposits? No, NEFTs are not considered as cash deposits/withdrawals. They can consider if required..
Sir, I’m a 59 years old divorcee and i have been recieving monthly compensation for the divorce from my Ex husband for the past 12 years now, I had saved that money(around 5 lacs total) in cash, and now deposited all that cash in my saving account (after Nov 10th 2016). I have no other source of income and all I have are the bank statements the compensation/ recieved over the years. How do I may my taxes now, and what are the rules/procedure for this case? If you receive any ‘compliance notice’, you may just reply to the notice by providing the copies of your bank statement, the court order for Alimony and self-written letter. Are you also referring to filing your income tax return for FY 2016-17? And yes Sir, I’d like to know if I have to register and file my income tax return for the coming year. Kindly go through this article : Do I need to file Income Tax Return? One of my NRI friend transferred around 4 lakhs to my indian Savings Account in 2016. Shall i need to disclose this in ITR-2017 as income? , Is it taxable?. It is better to disclose. May I know the purpose of transfer? If you hold undisclosed wealth and caught by IT department, then flat 60% tax plus a surcharge of 25% of tax (15%), which will amount a levy of 75%. Besides, if the assessing officer decides he can charge a 10% penalty in addition to the 75% tax. Kindly note that this is still a proposed amendment which is yet to be made as an Act by the Parliament. I accepted about 1.5 crores of my brother’s black money into my NRO account under the wrong assumption that NRIs are not impacted. I live in the US. Reading about it more, I realize the spot I have put myself in. I am answerable to the money in the US too. What would be your recommendation? Dear Vijay ..Kindly consult an NRI taxation expert who is a CA. How much cash can receive against credit sales? I have made a cheque deposit of 90000 to my account via forex. And bought some share worth of 1.5 lakhs, through online transactions. Will it be a problem, kindly guide me on it. 1Q- i have did FD for 3 lack in September 2016, so now, can i deposit 1.5 lack in my Account???? Dear Atul..Up to Rs 2.5 Lakh cash deposit can be made without any issues. I am working for more than 10 years and receiving salary in cash now I have around 6 lacks in cash ( It is my saving after from my salary ). Is it taxable or not, because my salary in current years is less than 2,50,000. But if you cash deposit Rs 6 lakh now before Dec 30th , you may have to justify your stand to the IT dept (if you get any compliance notice). I have partnership firm 1.3 year old, & i filled ITR for firm & both Partner. I am dealing in Job work for printing & 50% payment come in cash mode. i have deposited 3 Lakh in my Current account & issued chq to other party where we buy raw material, Room Rent, Electricity Bill etc. now I am worry that if IT ask to source of this 3 lakh, what can i do because all work done without any Proper Callahan as Job Work. Kindly file ITR accordingly in AY 2017-18, shouldn’t be of any issue. Maintain all bills and property accounting of your transactions. so far.kindly inform whether she has to file IT Return for the current financial year. Filing a tax return for your losses helps to carry them forward to future years, in which these can be set off against future gains when they arise. Any short term capital loss from Equity Shares can be set off against short term capital gains or long term capital gains from any capital asset. If you have not been able set off this loss entirely, you are allowed to carry it forward for 8 years . nice to see ur replies, I am working in shipping comp. & get salary after deduction of tax. My wife is freelancer & earns income too & since last 04 years ITR is well filed, but she has no expenses as every single penny is well saved. My question is total saving is 6 lakhs of 4 years & ITR well filed showing all income without any expnses. Now how to deposit this amount, can u advise shall i deposit only 2.5 or all 6 lakhs ? i am confused here. ! If you have not concealed your precvious years’ income and has been filing your ITRs honestly and accurately, you can deposit Rs 6 Lakh. But if you do Cash deposit above Rs 2.5 Lakh , you may receive compliance notice from the IT dept, which I believe you can justify your stand based on your ITRs. 1) If I gifted this whole transaction money to my family member via cheque/NEFT then I don’t need to pay any LTCG tax on this transaction is it true? 2) Can I gift 30 lac rupees to my family member via cheque/NEFT without making any gift deed? Also I am not filling IT return as my annual income is within IT slab limit. 1 – You have to pay Capital Gain taxes on sale of property. 2 – You can gift. Read: Got a Gift? Find out, if it is Taxable or Tax-free? Will there be any consequences of depositing large amount (2 lakhs)in jan dhan account? Dear Arun..If it is your accounted money and from legitimate sources, no issues. does the 2.5 lakhs deposit limit include the amount which is already present in the savings account? Cash deposits made during Nov 9th to Dec 30th 2016, can be tracked. Sir can we deposit total 1,80,000/- rs. in multiple transaction in mutiple date. So we not fall in any category of more then 50000 in a day & 2.5 Lac during these 50days. is there any problem in depositing only 1.8 lac rs. old note in multiple transactions. It should not be of any issue. If you have been filing your income tax return, don’t worry! Cash Deposit more than Rs 50k, banks insist on PAN. in case of non filing of return then any problem sir? I am a salaried person working in a private sector and my annual salary is 5 lacks. I took 2 personal loans in between 2016 to till date and total loan amount is 2.5 lacks. Here my question is the total deposits(cash and neft) exceeds 10 lacks is there any problem with IT. I have form 16 and ITR returns. Is it applicable only cash deposits or including neft transafers also. Please give me an advise. If you are referring to the new threshold limits regarding (old high value notes) then its applicable only for Cash Deposits. Hello sir , I have 2 bank accounts ( 1 saving and 1 individual current Acc ) in same bank . 1. My query is will I get any IT notice for receiving more than 12.5 lakh in current acc by online transactions Mostly rtgs or neft done during this Nov 8 to Dec 30 . 2. Suppose if I receive online transfer of 11lakhs in current account ( under limit of 12.5) and tell my persons to transfer balance 2 lakh to my savings account same bank (under limit 2.5) will I get any notice . 3. Please note that I’m just receiving via online from friends account , strictly none is cash deposit . I file my tax returns every year . 1 – Online transactions, so NO. 2 – Kindly note that Rs 12.5 Lakh is the threshold limit for CASH DEPOSITS and not for online transfers. I am planning to sold my exisiting flat which is worth of 50 lac and planning to buy new flat which is worth of 75 lac . buyer of old flat is paying by cheque and i will also pay for new flat with cheque . As these are Cheque based transactions, I believe there should n’t be any issues. Kindly note that TDS is applicable if the property value is > Rs 50 Lakh. Kindly calculate the capital gains (if any) on the sale of your first property. Read: How to save Capital Gains Tax on Sale of Land / House Property? I am a house wife. My brother borrowed money from me before 1 year. I pledged my jewels in 2 different bank accounts for 15 lakhs nearly and gave him. Now he is ready to return the full amount in old currency. If i pay it in jewel loan account will there be any problem? There should not be any problem but IT Department may question you the purpose for taking loan and paying off it so early. You might be questioned for source. You should be in a position to clarify them. But, is depositing old high denomination notes in Loan accounts allowed? Some persons are depositing their black money into their loan account as there is no reporting of such accounts in income tax department. Is it right? I don’t think so. Everything is linked to PAN. I believe that pre-closure of loans of Rs 50,000 or more can be reported by the banks/lending institutions to the IT dept. Yes, all these transactions can be tracked. I am a small business man (basically a transport commission and broker agent) filing my IT returns for the past 6 years adding on rupees two lakhs per annum to my capital cash balance. Now for instance my cash in hand balance is rupees twelve lakhs but i dont have that amount of money with me in cash as on date. Now after demonetization the govt says to deposit the amount in cash in large currency notes in bank accounts. what should i do. also my It return for the fy 15-16 is pending which if i file will add more 2 lakhs to my already inflated cash in hand. what should i do. if i deposit half the amount which i have as cash with me that is understood as that the remaining cash is in the form of small denominations. please help me as to how i should file my pending It return and what measures should i take for the current Fy. I don’t understand what you are saying but as you are basically a “transport commission and broker agent”, IT department will definitely will have an eye on your transactions. IF I AM PAYING TAX ON MY ONLINE SALARY DEPOSITED TO MY ACCOUNT BUT DUE TO SOME REASON I HAVE 2 LAKHS ( FRIENDS RETURN ME MY MONEY BORROWED BY THEM) OF CASH IN MY HAND WITH OLD CURRENCY, IF I DEPOSIT THAT CASH IN TO MY ACCOUNT, IT NEEDS TO PAY TAX OTHER THAN MY SALARY? OR I CAN DEPOSIT CASH UP TO 2.5 LAKH WITHOUT ANY TAX / PENALTY LIABILITY. You can. There won’t be any problem as you are a tax payer. 1) Today I check my Salary account statement for current financial year , total 19 Lakh deposited till date , my monthly income is 80,000 Rs apart from that I am using Bajaj Flexi loan facility , and hence many times I deposite monthly balance to the account and whenevr required I fetch back to my salary acccount. All the transactions are ONLINE/NEFT/RTGS. Does all 19 lakh will be under IT scrunity or my salary only comes under tax. 2) I am using 3 credit cards, till date when I add all purchases and payment of credit cards in total its arround 4 Lakh, does it causes me some issue, though I check in 26AS , in AIR section there is nothig in it. 1- As there are online transactions, kindly do not worry. Do file your income tax return including all your sources of income & home loan details. 2 – As long as one does not conceal income and have disproportionate income, so long no worries. Thank You Sreekanth for the query resolution, Every year I file my income tax return. I have FD with bank beyond 2.5 lakhs deposited somtime last year, I have also submitted PAN and Form-15 h as well to the banks, also included the interest amount in my IT returns as well as additional source of income. Out of the FD’ which was created last year nov 11 has been renewed automatically due to maturity on 11th nov 2016 by bank this year worth of 2 lakh and 50 thousand FD. Do the banks report this deposit information as well to the IT department ? Also do i have to include my FD amounts as well in my Returns ? Actually i have witthdraw some portion of my PF as well as redeemed my mutual funds investments earlier and made FD’s along with some amount borrowed by my Mother due to personal reasons. Please suggest what’s the tax implication ? Time deposit renewed on maturity date, is not reported to the IT dept. I am a retired government employee of 65 yrs old having income through pension only of Rs 180000 annually. Purchased a 1BHK flat in Jan 2012 at registry value of 12 Lac & sell it in Oct 2016 at registry value of 32 Lac Kindly tell me total how much Tax to be payable in this transaction in both (Indexation & without indexation method). After paying said LTCG tax I am planning to gift remaining all money to my sons wife.Can it is possible. Kindly note that amount of Rs 12 Lakh is your legal money, how are you going to handle the remaining amount as it is not part of the registered deed? I purchased by registered value 12 Lac & sell it in registered value of 32 Lac. Now answer my above questions. Long Term Capital Gain Tax with indexation (at 20%) is around Rs 3.2 Lakh. Kindly note that if you gift the proceeds to your Son’s wife, ‘Clubbing of Income’ provision will be applicable. Kindly note that rules of clubbing of income comes into picture if you gift a certain amount to your spouse, or minor children or Son’s wife. Any income earned by the recipient on the gift shall be clubbed with the income of donor (you). Kindly read: Got a Gift? Find out, if it is Taxable or Tax-free? actually she is planning to purchase shares of gifted amount for long term (say more than 2 years).In this case if she earned some profit also then it become tax free isn’t it? So no effect of clubbing of income on me Is I am right? If she is going to earn tax-free income, then the effect of clubbing of income won’t be there. For ex: If she invests the amount in say Tax saving ELSS mutual fund, then any gains on this investment is tax-free. Dear Ricky..Did you deposit Rs 2.5 Lakh in any one account? NEFT of Rs 2 Lakh is not an issue. Dear Ricky..Then its not an issue. 1. For online transactions exceeding 2.5lakhs also do we get notice from income tax department? or is it restricted to only in-cash(or physical) deposits? 2.We sold a house within 2 years of buying for 30.5lakhs of which we paid 15lakhs to clear the loan and the rest we cleared debts taken from lenders and we have no cash remained in our hand came from selling. So, for this also do i need to pay any tax? 3.The buyer had sent the amount 5lakhs through online to the loan account to clear. So, will it lead to getting a notice from I.T department. 1 – Only Cash deposits during the period 9th nov to 20th dec, 2016. 2 – If you have made gains then you need to pay tax on the short term capital gains. Read: What are capital gain taxes on sale of property? 3 – If it is not cash deposit then no issues. Starting this month I wanted to keep money in mutual funds with STP option of lumpsum amount in 2 different funds. Each fund with Rs 10,000 per month STP which will amount to Rs. 2.4 lakh p/a. Since the article says, If you buy mutual fund units worth more than Rs 2 Lakh, where do I show this while filing my ITR that I bought MF’s to avoid tax notices. Kindly note that it is Rs 2 Lakh per AMC/Fund house. The Mutual fund house will report it to the IT dept. There is no need for you to show the purchase details. In case if these are ELSS funds, you can claim the invested amount as tax deduction u/s 80c. Hello Sir, I have made selling of my property worth Rs. 47,00,000/- and from that 3000000 we got white money and rest black. how to handle in this situation. I am willing to pay tax and declare cash income which i have received from the buyer.My problem is how to prove that i have received thc cash by selling my property secondly will any notice will be issued by the it dept. if i declare or ready to pay tax. Rs 17 Lakh is black-money. If you chose to deposit this money in your bank account, you may get notice from the IT dept and you may have to pay tax on it + penalty of up to 200%. Suggest you to consult a CA. Sir, I will pay tax on it in the end of March 2017. and How’s it if I add this amount in sale deed agreement. will it be a proof of my income? Dear y l christian.. Yes, advisable to have Sale deed registered for the entire value (Rs 47 Lakh). Thank you sir for the concern. Certainly I will go for it. My friend had booked a plot in some area in Rajasthan in his wife’s name. The Builder had issued a cheque worth Rs. 9 lacs. Can my friend deposit a cheque worth Rs. 9 lacs in his wife’s account. Is any income tax levied on this amount. please tell me. Bit confusing..If they have booked a property, how come the builder has issued a cheque?? I am running my own business. And my income is around 8 lakh per annum. But in last couple of years , I borrowed money from my friends and relatives. I invested this money in intraday share trading. I got addicted to this and lost more than 20 lakh Rs in two years. Now from last 2 or 3 months i stopped investing in shares. But I didn’t file any ITR as I incurred a huge loss and my income is below 1 lakh after deducting my losses for last two years. Do i need to file ITR? My bank account is showing high value transactions but i didn’t keep the record of all as i borrowed so much money (around 7 to 8 lakh) from family and friends which i deposited in bank account. So how it may impact? Yes, you need to file ITR. Suggest you to kindly consult a CA at the earliest. if my account had 2 lakh earlier and after modi announcement i add 1 lakh .now my total money extend 2.5 lakh . so please tell me i will get a notice by income tax dept or not.and how to resove from this. My Annual Gross salary is Rs 180000 and i got previous 5 year incentive from my company as per verbal discussion of Giving me 2000/Month but after 5 Year they provide me the amount this year in installment of 20,30,40 thousands from last 6-7 months. due to high amount and i have transacted these amount from my account to other at the same month Now my total transaction amount is about 8 lakh this financial year.Also some other transactions like someone have no account and he credited the amount to my account and i transferred those amount to other places. If your earnings are below Rs 2.5 Lakh then your tax liability is nil. You may kindly advise your friends or relatives to open bank accounts and stop using your accounts for transactions unless it is for emergency purposes. You can deposit back the amount in your account and you may pay for the construction expenses through online money transfer or through cheques. people are creating black money by depositing money into there loan accounts ,into there file . I am an IT professional who is paying tax correctly. I am working for the past 2 years. My mother is a widow. My father died in 1995. My mother has sold my father’s properties and her gold ornaments and she lent money to my relatives for 1% ROI and my mother used to save a lot of money by investing money in local chit funds. She has saved nearly 20 Lakhs till now which is all with my relatives. One of my relatives returned back 6 lakhs on November 1, 2016. Now we have it as cash in hand. My mother has bank account without PAN card. How to deposit this cash in bank now? Will we face any legal problems? Can the remaining money be retrieved later from my relatives? Kindly help me in this regard. I have one clarification. i am working in IT organization.My wife is housewife. The total saving amount is with my wife account around 15 lahk, which I have earned by doing freelance kind work in this financial work . All the transaction is done only in online. Now she has 15 lahk as total in her saving account from last few month (before nov. itself). I am paying tax every year through my company. Is there any issue of holding 15 lahk in saving account of my wife account?..this is my earned amount…please clarify. I think more than Rs.10 Lacs in Savings account will be questioned by IT Dept. If you have earned this amount in this year then you may need to show this as your income in ITR and pay tax. This can be considered as Gift to your wife. But, kindly note that clubbing of income provision is applicable in this case. Any taxable income on these savings have to clubbed to your income and file taxes accordingly. Read : Gifts & Income Tax implications. Hello sir,i sell my site on 10/11/16 at 6lakh sixteen thousand rupees government stamp value is 5lakh same day he give me a cross cheque and amount 6lakh will be credited in my saving account then site registered complete,know I have 6lakh in my saving account it’s any tax problem? please advise me send reply as soon as possible thank you. In this scenario, Rs 1 Lakh is unaccounted money. Sounds like clarifying doubts in case of Binami. Daily labour with monthly income of below 15K with pretty good English. Fishy! Dear Raj..Advisable to avoid such deals/transactions. I have one clarification. i am working in IT organisation.My wife is housewife. The total saving amount is with my wife account around 15 lahk. All the transaction is done only in online. Now she has 15 lahk as total in her saving account from last few month (before nov. itself). I am paying tax every year through my company. Is there any issue of holding 15 lahk in saving account of my wife account?..this is my earned amount…please clarify. You can consider these as Gifts to your wife. But kindly note that the interest income earned on these deposits should be clubbed to your income and you have to file your Income tax return accordingly. Can I make my credit card payment which is less than 50K using the 500, 1000 Rs. notes which are retiring soon. Would this amount add upto the 2.5 lakh limit set by the Govt for depositing these notes or would it be considered separately? Also, I have a similar question for a car loan that I have. I want to make a foreclosure payment less than 50 thousand rs. against this loan using the 500, 1000 notes I have. Would this also add upto the 2.5 Lakh Rs. limit or would that be separate? The notes (old design) have already been banned. Kindly understand that there is no ‘threshold limit’ for depositing the monies in a bank account. One can deposit unlimited amount of money as long as it has been accounted for and is from legitimate sources. You may deposit your high denomination notes in your bank and then can make your Credit card payment or Car loan repayment through Cheques or online-transfer. My uncle has sold his house in Jan 2015 for 31 lakhs and this money is deposited by buyer in his account. Unknowingly this txn was not filed during assessment year 2015-16. When he checked AIR txns in 26AS for FY 2014-15 and subsequent years, this txn was not listed anywhere. When he calculated , he observed that actually its a capital loss for him based on inflation price of house for which he bought it. Can he receive notices related to this txn in future? If he gets notice , how to handle this ? Even if he receives the notice, if you can justify with documentary evidence that it is a capital loss then there shouldn’t be any issue. You may suggest him to keep a copy of original sale deed + latest sale deed (can request from the buyer, if possible). My uncle has one more query . Actually when be bought property , it is registered for less price . Sale agreement is having actual price. He is saying its capital loss considering “sale agreement price when he bought” and “sale deed price when be sold”. Is “sale agreement with builder when he bought” is good enough to show as proof ? Even if AIR transaction (26AS) is not showing in that year , can notice come in future ? Dear Sonu..Registered Sale Deed is what matters! hi sreekanth i just want to know that i was just planning to setup a business and my father and friends just lend me a sum of about 6L and i had not yet started my business and was planning to start it in next year january as it was the correct time for it. I have been holding the money in my account from 2 months and still further i have to hold it for 2 more months upto time i start my business will i been send any letter from IT about to explain about the money you are holding in your bank account since the money is from my father and some close friends there is no agreement or bond betwen us about the money please inform me that it would be any problem for me??? should i have to trensfer the amount to my family to not to exceed threshold of 2.5L government passed recently. thanks for the reply. Dear ..The Govt has not passed any rule regarding the holding limits in a bank account. Was the money deposited in cash or was it online transfer? I believe that this should not create any issue at all. As everyone is aware of the 500/1000 notes banned in India, my mom has some savings done in cash. Kindly let me know what are the best possible ways she can save that money. This money has been saved over the years and was given to her by my father who is already filing ITR. Plus if someone has a 10 lkhs annual package, how much can easily be deposited by showing the PAN card. I mean above 2.5 lakhs? I was employed till june 2013. And then I left job to prepare for further studies. till now in FY-16 my transactions have been close to 2 lacs. with 4-5 months left. If my total transactions crosses 2L will I get a notice? And how should I respond to that, since I was working till june but rest of the credit card bills have been paid by my parents? Dear Abhi ..There is no such mechanism that if your total transactions cross Rs 2 Lakh you get notice from the IT dept. As long as your income/investments/expenses are disclosed correctly in ITR, kindly do not worry! One of my relative borrowed 15 lakhs from my father. Recently my father passed away in an accident. Now my relative would like to transfer that amount through NEFT. Will that be a problem for me. Can i get any notice from IT department? I don’t think my father filed an ITR. Basically he was a farmer. Is it safe to ask him to transfer to my account. Please advice me. Was there any promissory note or loan agreement done between both of them? as the amount is on higher side. You may ask him to do online transfer and not a cash deposit. Is AIR is filed for NRE account also? If yes how they file AIR without knowing PAN CARD number? I have made few FD in my NRE account, do I have to pay tax on them? Dear Leela..Haven’t your bank asked for your PAN number? Yes, for NRIs the PAN card is not compulsory to open a bank account. If you do not give PAN number to your bank, TDS can be levied. I am having some important query for me. I have 2 different bank account. I made fund transfer between these account multiple times with that same Rs 30000 . I have only Rs 30000 but making the imps transfer between these 2 account will reflect the account that Rs 1500000 is credited and 1500000 is debited in a month . Will i get notice from income tax department? How to know whether will I get income tax notice or I have to pay tax? Dear Sathish ..May I know the reason for doing these transactions? There is no reason for this situation,I am just asking the situation . How does income tax department take these situation? I have been in the tax slab of 30%. In order to save tax, I have used my father account to deposit FD. My Father has no income. In case if the sum of the FD deposit has been more than 5 lakhs, then my father gets any query from the Income tax Department. My Father has no other source of income. Also the interest received does not exceed Income tax slab limit. Shall I deposit more than 5 lakhs in his account? Yes, you can ..You may consider this as a Gift transaction. Kindly do cheque or online transfers only. Kindly read: Gifts & Tax implications. I would like to know intimation is sent for buy the share or sell ? What will happen if we buy stock on feb 2013 and sell them in july 2014? In that case I can’t mention this information in 2013-2014 income tax return. Did income tax department enquire about it or wait for next year income tax return? That is less than 12 months holding period. In case of any short term capital gains, ideally you would have paid taxes on gains when you filed your ITR for FY 2014-15. I agree with you but my question is in which financial year income tax department will get intimation from stock broker ? They may not get intimation from stock broker. You need to disclose your income in ITR. I need your suggestion on this, I have couple of credit cards and my friends use them for cash transactions lets say (they swipe them in outlets and get money from them for some percent of commission. Later at the bill time they transfer the money to me to pay my credit card bill. Like this the transactions are getting high, lets say upto 5 L per year. Are there any issues on this for me going forward? Dear Razzu ..Advisable to avoid such transactions..
Hi Sreekanth , I purchased a land by borrowing 15lakhs from my friends circle and I purchased it . I am planning to return the money on emi basis. Do I need to pay tax for the amount which I borrowed from my friend’s circle in the financial year. Can I show this as a source money for buying my property ?? You can show this as Loan acquired to buy the property. There is no need to pay tax on this. Suggest you to maintain a loan agreement(s) regarding this. Thank you Sreekanth, But we have not yet signed any loan agreements ,can I use the bank transaction as a proof of source. or shall I make an loan agreement in the current date. Dear MOHAN ..Loan agreement can be a better option. Kindly save the bank statement copy for future reference. Thank you very much for your advice on this. The balance of Rs 30 L will be treated as BLACK MONEY. If you are willing to pay tax on the entire transaction, suggest you to find a buyer who can register for the entire value. It is wise to keep the entire transaction as legal one. Thanks for the reply. What would be the tax rate if we do so? Dear Rekha ..Kindly go through this article : Capital Gains Taxes on sale of property! Dear shahrukh ..For business related purposes, it is better you use Current Account. Hi Sir, I have shop and having individual current account.. have Pos machine ( credit card swipe machine ) in case of emergency my friends and relative swipe the card get money from me. its illegal ? because per month they will swipe 3 To 4 lakhs. my question its penetrating us to file IT. I am not register my shop in any SSI and TIN etc. Is there a risk form IT department for me . please let me know. Dear Deepak ..You are advised not to continue doing this. Better to avoid! My Cousin (37 years) runs a shop and has been filing the return since 5-6 years. Last year his income was around 6L and paid Rs.8000 income tax. He wanted to purchase a plot whose market value is more than 30 L. He will include his wife (housewife) in the sale deed. He is actually taking some hand loans from relatives and some from chits. Please advise the best ways to avoid any notice from IT. or should he need to go for loan on gold for some amount. Please let me know if I need furnish any further details. He can get Loan Agreement done even for Hand loans, if his friends or relative are ok with this. He can even claim tax exemptions by on the loans.. But he has to maintain all the documents in place and has to prove that he has used the loans for construction related expenses only (if required). The type of loan, he himself has to decide, as to which one is better to him. My Father in law is planning to buy a car from his savings done in FD.Now The total amount is around 9.90 lakhs which need to be paid. Is there any fear of tax department will send a notice to declare from where the money came.The FD were on my mother in law name and all 15-g forms are filled. So, Should we go for full payment by aggregating the amount in one account or should we go for loan option? If the FDs are out of their own savings, why should they be afraid. Loan Vs Own funds, you need to take call based on your existing financial profile and your future requirements. Kindly note that purchases of car worth more than Rs 10 Lakh will be subject to TCS (Tax collection at Source). Tax at source of 1% on purchase of luxury cars would be levied. So, kindly check this with your dealer. Thanks sreekanth for the advice. Very much thanks for your prompt response. If yes then how much past years? Dear Gajanan ..I believe from AY 2008-09 onwards they have the data. You can check for AIR transactions (if any) in your Form 26AS (previous years’). I got 30 Lac from selling my property now I am planning to give this money equally to my son & daughter in law via cheque. Is there any issue?which precautions should I take while doing this transactions? The gifts to your son & daughter-in-law are tax-exempted. But, kindly note that rules of clubbing of income comes into picture if you gift a certain amount to your spouse, or minor children or Son’s wife. Any income earned by the recipient on the gift shall be clubbed with the income of donor (you). It means that I have to not pay any capital gain tax on selling said property? Also please tell me that can it is mandatory to make a gift deed OR just giving a cheque to my son (Tax payer in 10% slab) & daughter in law (house wife) is sufficient? No taxes are applicable on Gift transaction. Executing Gift deed is not mandatory. You may issue the cheque and keep a copy of it for future reference. You may suggest them to show it as an Exempt income when they file their income tax returns under ‘EI – schedule’ of ITR. I am planning to sell my 1 BHK flat in 32 Lac (Registry value 20 Lac) but purchaser willing to give me complete amount in cash. So my question is how to deposit this amount in my bank account.I am retired person. If you have to deposit in bank account then suggest you to have the registration value as Rs 32 Lakh only. You may receive it in cash. Also, note that the Registrar of properties will have to report purchase & sale of all immovable property exceeding Rs 30 Lakh to the Income Tax authorities. 3) However, my MF investments are not from any undisclosed sources but are from my overseas salary earnings, remitted to my NRE account in India, transferred to my NRO account and then invested in respective MFs through a MF advisory. Under the circumstances explained above, am I required to take any action while filing an ITR and if yes, where should it be declared ? 2 – The limit has been revised to Rs 10 Lakh per AMC (fund house). If you have any source of income and file tax return in India then you may have to just disclose your Assets & liabilities in ITR. Kindly take help of a tax expert. A company has to report receipt of Rs 10 lakh or more from a person/an investor in a financial year for acquiring bonds, debentures, shares or mutual funds. Yes, the limit has been increased from Rs 2 Lakh to Rs 10 lakh. And I believe that it is per AMC. I had sold a plot in 2014 @ 200000 and the amount was kept in Allahabad Bank. Now IT department give a notice in last month. When I met the official they shows me as per their records I had kept 20000000(two core) instead of two Lang. Now I can’t understand what action I have to take. Please help me out of this problem. I can’t sleep because of this from last one week. Dear Subrata ..If so, you may disagree with the notice. Did you find any ‘pending actions’ after login into e-filing portal. I am using credit cards and total outstanding amount almost 20 lacs. I used to borrow some money and clearing it. In some cases i am reusing credit cards. As for as i know the amount paid to credit cards should not greater than 2lac per annum. But i am sure I will cross this amount. can you please suggest how to handle this ? Dear Karthikeya …Either you have to justify your transactions to the IT dept in case of scrutiny (or) you may opt for limiting your transactions. One more doubts. credit cards payments means they consider mode of payment is it cash or online transfer. which will be considered? Dear karthik ..I believe both modes..
Hi Sreekanth..read your article on high value transactions and tax notice. Can you clear my doubt? I want to purchase a new car ,, exshowroom price is 4,25,000 and on road price is 4,70,000. I don’t file IT returns. I am running a Spoken English coaching centre. The. Dealer said it’s okay to buy car readycash under 5lakhs and there will be no tax notice.but I am concerned. I can get a loan of needed. But I want to buy readycash.. Plz tell will there be any issues if I buy readycash?? Please reply . Quoting your PAN is compulsory, so your transaction can be tracked. ars priced more than Rs.10 lacs and transactions where the buyer is paying more than Rs.2 lacs in cash for motor vehicle purchase is required to shell out 1% TCS (Tax Collected at Source). In your case it is less than Rs 5 Lakh, so I believe that TCS is not applicable. Also, kindly cross-check this with your car dealer. Mu name is sumit jain and I am operating a trading &demat acc.in my wife name, ubknowingly I have deposited Rs.1150000 in her saving acc.and purchase a equity of it of differwnt company’s. Her source of income is trading of sarees and clothes, tuition income and FDR income. What next should I do to avoide it notice regarding cash deposit. Dear Sumit ..Kindly consult a CA. This is raju from telangana my parents sold 2 acre land in the year of 2013 march. At the time govt. registration market value is 52 lack per 2 acre and we sold for 25 lacks (the land price is low compare with government registration market value )and we invest that amount to purchased agriculture land in another area land cost 22 lack ..
Dear Kumar ..At what price the transaction has been registered (Value mentioned on Sale deed)? Even if it is Rs 52 Lakh per 2 acre, why is that the IT dept asking for explanation pertaining to Rs 70 Lakh?? Suggest you to consult a Chartered Accountant and take advice. As per registered sale deed documents that the land market value is 70lacks .. But we sold that land 30lacks because in my area there is no land value (local market) . Dear Kumar ..If the registration is done for Rs 70 Lakh then you need to provide the documents for source of funds and also provide the PAN number. Kindly consult a CA and respond to the notice. Read: e-Sahyog – IT Dept online facility. audit of charitable trust after due date is possible or not and what about benefits? Dear rahul ..Suggest you to kindly consult a Chartered Accountant. Dear Dr Venugopal..It may not attract. But suggest you to get a Gift deed done stamp paper mentioning the said details, just in case for future use. If I transfer say 5 Lacs from one of my saving account to my another saving account, will this get reported to IT department? Dear sir, i am receiving my salary from our US office ro my bank account. Today o received a call from my manager and he was asking that transactions. I told jim that it os salary getting from my company’s Us office and he said how is it possible? Dear Baljit ..Unable to understand your query, kindly rephrase it. I’ve a query that if someone makes multiple bank accounts and and he makes money less then 10laks pa in all of his accounts than how banks will know that this person has more than 10lacs PA if they count all the accounts balance. Dear Kapil ..Why will banks count? A bank will not have access to your other accounts. So they can’t report the High value transactions right? I have one very worrying concern. If one receicves huge amount of money from abroad in cash in US dollars through diplomatic means. Upon depositing the money in bank account by forex enabled branches in bank. What would be needed to prove the source of money? upon declaration of the deposit in ITR . What tax liabilities arise and what legal documents are needed to prove the source of income. Dear Jagdish ..What is meant by ‘diplomatic means’ ? Dear Jagdish ..Dont you think it is illegal to get the money like that. I am not very sure of this. Kindly consult a CA. i am going to sell my ancestrel property for 60 lakhs and with that amount i am going to purchase the another site for 64 lakhs. i will be getting 60 lakhs as DD amount from the buyer. but my land lord is insisting 43 lakhs DD and remainining 21 lakhs as cash. how to withdraw 21 lakhs from the bank… will there be any problem from it department??? Dear Sanjiv ..I believe there wont be any problem in withdrawing Rs 21 Lakhs in cash. However kindly note that you are converting WHITE MONEY into black money to the tune of Rs 21 Lakh. So, kindly re-think about this point. Read: How to save Capital Gains tax on sale of property? but we filed IT returns for last 3 years. we unable to get housing loan in her name. if we purchase flat. it may causes any IT PROBLEM? does it attract any extra penalties/taxes from Govt? Please advise. Dear raj ..What would be the amount on the Sale deed? Are you going to get it registered for Rs 40 Lakh? sale deed amount is @ 41 lakhs. suppose if we are going for cash payment. through our own sources . we plan to barrow from our relative . how will we handle IT department. kindly help us. my sources: 1. my wife ‘s business . i am also working for pvt company. 3lakhs p.m. past ten years. Dear s Raj ..You can treat it as a LOAN too (from relatives). I would like to know what is mean of cash deposit in bank account, will it account money transfer by someone online in our account or cheque deposit ? Depositing Cash in bank. (not through online transfer / cheque deposit). From what I could understand from the write up is that the fund house will send my details to IT dept. if I buy MF more than Rs.2 Lakh from them in one financial year. But if I buy mutual funds worth Rs. 1 lakh from 3 different fund houses (total 3 lakhs in one financial year), will it still be considered high value transaction and will be passed to IT dept in AIR. In other words, will all the three fund houses also will send the details even if the purchase from them individually is less than 2 lakhs. I believe that the limit has been increased to Rs 10 Lakh. (I believe that it is per AMC). Kindly note that this is just an information report and you should not worry about the report going to the IT if you have been paying tax regularly and the computations are fair and clear. I’ve a question regarding investing in the name of parents. My father runs a small provisional stores, the income from the stores is very less. He also pays the taxes related to shop to maintain the licence. My mother is a house-wife. I belong to 20% tax bracket and I usually have about 40-50k INR left at the end of every month. I plan to open SBI/SBH accounts for my father and mother and invest in e-FDs in their name to save on TDS. Is it a good idea? Or does it attract any extra penalties/taxes from Govt? Please advise. May I know what do you mean by save on TDS? Kindly note that interest income from FDs/RDs is a taxable income and income tax has to be paid based on the applicable tax rate (if any). Why one should avoid investing in FDs/RDs for long-term. Many thanks for the reply. Save on TDS meaning if I open FD in my name, the tax on interest is payable at 20% as I’m in that bracket. But in case of my father or mother, their annual income is almost zero, so with Form 15G in place, I feel there isn’t any tax on the interest earned. I just would like to know if there will be any complications in future? BTW Thank you for the links. I did go through them earlier. The gift implications in the link is all about 50k per year. But in my case I will be transferring to their accounts almost 50k every month. So what may be the tax implications and if any work arounds? And these FDs are only for short term. I don’t wish to keep the funds in savings account at 4%, rather put them in FDs for a while. I building corpus for a real estate purchase in future. Hope I’m clear. Please clarify. There won’t be any complications. But if the interest income crosses the basic exemption limit then they have to file Income tax return. Gifts to parents are tax-exempt. Kindly go through the link again. My Parents owned a 2 Bedroom flat In mumbai. After my Parents death, we three children got equal shares in the flat. Currently both my sisters are staying in the flat. They have now decided to give me my share in cash //cheque, which may amount to quite a sizeable amount. My question how do I invest this money in the bank. Will I have to pay tax. How do I avoid paying the tax. What is the minimum amount I can invest in financial year, to avoid coming under the radar of high value transactions by the bank. A Relinquishment Deed can be executed. A relinquishment is basically giving up ones right in the property, which might be inherited or parental, in favor of another legal heir(s). This relinquishment can be without consideration or with consideration (as in your case). If the value of the property (your share in the Deed) is more than Rs 30 Lakh then it can get reported to the IT dept. Kindly note that when you are relinquishing property for monetary consideration, it will result in capital gains. Read: How to save capital gain taxes on sale of property? Dear Sukumar..Yes, you may do so. I got a notice from Income tax dept . request for linking of large value transaction to a valid pan. got a house for 35 lakhs in fin year 2013.
there are 2 transaction sequence # for the same amount. both are having filer TAN as subregistrar. Dear Chandramouli ..Kindly consult a CA and take help. My query is i have received a notice stating SUB: request for linking of large value transactions to a valid PAN. transaction is relating to sale of immovable property of 55lakhs. what happens if i link my pan no..
Have you not provided your PAN for the property sold? Whether the transaction registered value was more than Rs 50 Lakh? I have a query. I have withdrawn 4lacks and 3lacks from SBI in cash. Can IT ask me about these withdrawals? I mean where I have spend these money? I am having a confusing situation.iam a student and frequently I get some money in the form of gift cards from my family and friends.instead spending then and there I withdraw from it and deposit in my bank account.now it is added upto 5lakh.sometimes around five to six times i did transactions online like in flipkart and canceled them due to some issues and refunds have be done to my account.will I have to pay as it exceeded 10lakhs tax,my pan is not linked with my bank account.will there be any problem.i hope you reply earlier. Suggest you to kindly get your PAN linked to your bank account. You may or may not receive compliance notice from the IT dept. But advisable not to repeat the unwanted transactions again. Also, its better you save the details of all gifts for your future reference. Sir would plz clearly explain my issue more elaborately.what are high valued transactions and only bank deposits are considered or even online transfers from various sources.iam student and I require 5 more years to complete my studies and get a job.i receive various gift cards from my family,sb reward portal.the gift cards which I receive from my family are mostly from sbi.so instead using from them I just transferred the money from gift cards to my account using online digital wallets as money from gift cards cannot be withdrawn from ATM.it is now added onto 5L as said i tried spending this 5L in an online website around 5-6 times but cancelled them due to some issues.is this considered as high valued transactions,will I get any problem from IT as I don’t have any source of income as Iam still a student.can I do FD for this 5L but ism not an employee,so will get any problem from bank or it.i request you to please explain every thing very clearl. I am NRI and sending funds to my father(farmer) account for so many years but 6months before my father got a Notice letter for 2013-14 FY from IT that “some transactions are above 2.5lacs”(as per PAN) so need to file ITR. We have consulted CA and submitted all documents as he requested. Finally CA says to us that as your is doing agriculture and my income already taxed in a foreign country, so no need to file and ignore the notice (if anything comes up CA will take care). Could you please tell me, shall we stay on CA words (or) what kind of problems can happen in future. Until now we have not taken any action. If your father has only agricultural income then such income is tax-exempt. The money sent by you can be treated as GIFTs and even such income is tax-exempt. But in case if your father invests such money in other investment avenues which if generate taxable income then he has to file Income Tax Return. I have received the notice from income tax regarding sold of immovable property values at Rs 57 lacs but sir I have received only Rs. 3,56,250/- by cash. I am an agriculturist and I have never return in earlier and now. Property sold was hereditary and 16 members are legal heirs. Kindly advice what to do in this case. Was the property solely owned by you alone? Was it registered for more than Rs 50 Lakhs? Is this residential property or Agricultural property? No, property sold was hereditary and 16 members are legal heirs and I am one of them. Market value of property at that time was Rs. 57 lakhs and actual sale value is Rs. 40 lakhs. It was residential property and chal was there. It was sold on 04.07.2013. If ok, do let me know what’s the notice is all about? Else, suggest you to take help of a Chartered accountant. I have a query regarding the income from other sources(Bank FDs). . I gave my PAN number while opening the account in 2010 but somehow bank has updated it incorrectly in one bank. but in other bank it is correct ,it deducts tax correctly. There was a one letter mismatch in the PAN number.i notice it now in 2015.my total income from both banks is 493000 this year and i have paid 23000 tax this year acc to tax liabilty of both banks and not only this year i have paid taxes acc to my liablity from 2010. Q 1. I want to ask, what will happen to the TDS which is deducted by first bank for the interest on FDs which have wrong pan. Q.2 I update the PAN in my bank account, now both income and TDS will start showing in Form 26AS correctly.now tell me does i need to worry because from now onwards income will be shown in form 26as.my c.a said you dont need to worry . sources of these fds were from grandfather fd’s and i have his fd copies. 1 – You can request your banker to file a revised TDS return. A) If the PAN applied against the TDS of your FD income is an invalid PAN, in other words, if the PAN does not exist, then the reconciliation process run by the Income Tax processing unit will identify a discrepancy and they will send a notice to the deductor (in your case the bank). B) If the PAN applied against the TDS of your FD income is a valid PAN, but belongs to a different person, then that person will notice it in his or her Form 26AS. He or she may bring this to the notice of the Income Tax Authorities and file the correct income tax return. If the PAN applied against the TDS of your FD income is a valid PAN, but belongs to a different person and that person does not notice while filing his or her income tax return, he or she may get a notice from the tax authorities for not disclosing the income against the TDS credit in his or her 26AS. The assessee will then respond to the income tax authorities. Hi Sreekanth,I’m Karthik I have a real estate business.My total savings accounts transactions have crossed 1.5 crores and among that 1 crore belongs to advance which i have given to another person and due to some reasons that person has returned that 1 crore through check,which i have deposited in another bank.Now my total savings accout transactions exeeded 1 crore upto 31-3-2016.Can u please suggest wheather i have to audit my accounts or not. Dear KARTHIK ..Kindly consult a Chartered Accountant. Sir I am an ex-army personal, now I engaged in agriculture activities I have 40 acere agriculture land. I harvest 100 tons potatoes from a single harvesting season and sold the same to a renounce LTD Co. under Buy-Back Policy ” In Which Company provides me Seed on its Rate and I have to Resale the corp to the Co again” in this transaction i have to purchase the seed from the company first than have to sale the crop to the company again. the transaction are made through my current a/c with nationalized bank. From this year the company appointed me as a broker or mediator under the same BUY -BACK Scheme under which I purchase the seed from company and supplied to different other farmers for growing the potatoes as per the company’s norms. after ripping the crop I have to collect all the and again resale to the company, and company paid the payment of all crop to my current a/c after receiving the same i remitted the amount to different different farmers as per the agreement. sir the amount of deposit & withdrawal of my current a/c is over than 500 Lacs in a year. sir will these transaction be reported to ITD. I am also filed the ITR in passed under which I have shown the Income from Brokerage which given by the company (TDS already been deducted) Please suggest me whether am I liable for maintain books of a/c U/s 44 ab or not. If you have all the documents in place, it is not an issue even if you get a Compliance notice. But suggest you to kindly take help of a CA in this matter. b.) I shift to my second house. So, I will not claim any HRA and will claim income+home loan interest benefit for first house. I want to avoid any query/notice from Income tax department in future. So which is a better option among #1 or #2. I assume both the properties (owned), rented house and office are all located in the same town/city. If you opt for option A, you should be able to justify your stand. If you believe that it is not possible to justify your stand, suggest you to opt for option B.
I had purchased an under construction property for 47 lakhs in Aug 2010 from builder. At this time, circle rate was similar to cost of property. I have got the possession now in 2016 and registry is supposed to happen in few months from now at rate of 90 Lakhs. The registry is happening at such a high price due to continuous revision of circle rates in NCR. Am I liable for any tax because of this ? Also, in the asset liability section for individuals with income more than 50 lakhs, should I report the cost of this asset as 47 lakhs or 90 lakhs. Dear Rohit ..I believe that you need to report the amount which is going to be mentioned in your Sale deed. I have returned from USA on may 2015 to settle here permanently, I have had some savings from there which has been transferred to NRE account and then to a regular account for fixed deposit, from which interest does not exceed 2L. I do not have any other income. Also recently I moved some of 401k which is taxed in USA to india and have put that also in FD, I will going over the tax exemption of 2.5L from this month. Should I be filing return this year or is there a need to disclose any of my bank deposits ? It may not be mandatory to file tax return in your case, but suggest you to file ITR by taking help of a CA. I have 35 Lakh deposited by cheque in my Savings Bank Account. If I withdraw more than 10 Lakh in cash, will this be reported to income tax office. Dear Upendra..They may not report it as AIR transaction. But do keep the documents (if any) pertaining to these transactions with you for your future reference/use. Hope you have documentary evidence for source of income on Rs 35 Lakh. i am an Indian citizen and have just recently come from the US. I want to transfer some of my US money around 50 lakhs into indian account. Will i be taxed for that as i made the money in the US. What is the best way for investment to buy one of my uncles share back in india. I believe that it is not subject to Taxes, if you are transferring to your own account. (assuming your current residential status is NRI). As long as you are paying taxes (or paid) on the income you are earning abroad, the money transferred into India is NOT TAXABLE. If the money is transferred onto the savings accounts of your family members they too don’t need to pay taxes on the money. Hi Shrikanth. I have purchased a flat 5 years ago but I have not registered it. So can I sell the flat without registering it as it was only for investment. Also can u pls tell me abt recliner rate. Still my point not clearified.I want to knowthat limit of 50 lakh will run singly on deposit and withdrawals or jointly.IE total 50 or total 100 laks for both. Could you also clarify if as an individual I need to fiill additiinal form and submit to ITD, to declare my such transactions? I am already filling ITR and all relevant account details in it. Dear Arpit..I believe that there is no need to submit investment proofs/expenditure proofs to the ITD along with your ITR. The IT dept may not be able to track your sales. They may issue compliance notice or call for scrutiny in case if they find any discrepancies based on your ITR and the information they have (PAN is the key link here). My wife is a state govt employee. She is getting a cheque from her mother of rs.40 lakhs. This has been given to her as a share of the property sold in her mothers name. This can be treated as a Gift. Gifts – Taxable or tax free? Thanks a lot.it s very helpfull. 15.5.2016. Posted query , reply is not cl ear. Again iamsending post ple troly. Ihave deposi i want to give as a cash 50000/- to my brothers and 25000/- to their children and also to my wife brothers and sisters and to my uncle and children.can i give as cash. 2. Qurey: i wanto give my friend 6.00 laks through, he will reverse without withdraw cash -after credt to account what is tax rule. I did not understand your query, hence I have asked if it is related to ‘gift taxation’?, which you have not replied in your comment. 2 – What is the purpose of doing these transactions? May I know..
Dear syama..Your income is below basic exemption limit, so there is no need to file your Income Tax Return. Income Tax Slab Rates AY 2016-17. Dear venkatesa..Is your query related to ‘gift taxation’? List of Relatives from whom you can take Gift(s) without worrying about income tax implications. Hi Sir I used to get IT return filed through one guy, but now when I cross check it seems my IT return was not filed for Assessment year 2013-14. It could be due to the confusion that IT return was exempted during year 2010-11, 11-12, if within 5 lacs. My annual income in that financial year 2012-13 was less than 4 lacs. My company paid the taxes, but it seems my IT return was not filed. What shall I do now. Read: What is compliance notice? But i dont file ITR as i am not in Tax bracket as i AVAILED home loan this year of 35 lakhs. So can i use credit card for exchange of money when in need. Dear Sachin..Suggest you to kindly use your Credit Card(s) judiciously. I would really like to congratulate and Thank you for such informative article which is really needed for our citizens given poor Financial/Inc.Tax literacy. And also for the prompt replies you have been providing to readers. Though I understand the basic nuances of transnational dealings, I had 2 queries which I hope you can clarify. 1. With boom of e-comm and offers provided by Banks(credit cards more specifically) , I end up with a lot of purchases online with my credit cards for my cousins , friends or family etc. And then I take the purchase amount from them, not always full in one-go but you can say split installments or summed up purchases in one payment , DIRECTLY TO MY CREDIT CARD FROM THEIR BANK ACCOUNT. E.G. – for ‘A’ I purchased a phone of 15000 in January and I received payment from him on credit card in feb (4k), March (2k) , May(9k). OR I made 2 apparels purchases for ‘B’ of 2k & 1.5k and got a single shot payment on card of 3.5k. Does that have a potential to trigger notice from ITD? P.S. – I try to ensure my Annual purchase on any one card does not exceed 2L. So will spread them across 5 different bank cards I hold. 2. If I transfer my salary , say 45k, from salary account to other saving account and then revert or may be circulate/move between them through online mode a couple of times aggregating to 70 – 80k in a month. Does that create any issue? P.S. – all the accounts in which movement /transaction take place are held in my name singly and are shown in ITR ( that is interest earned from all of them). And these accounts see no other deposit other than my salary and circulation among themselves only. Obviously I debit the account by cash withdrawals or bill payments as and when the need be. 1 – Yes, the probability of getting the notice can not be ruled out in the mentioned scenario. Your case might be genuine but you may have to justify your stand in case if your receive any compliance notice. You have to preserve all the documents/emails/credit card statements to prove your point. 2 – I believe that this shouldn’t be an issue. 1. Till now I haven’t preserved all the documents but yes , I do have all statements and purchase bills. But don’t have clear compilation of ‘payments received on card’ by whom. What can be done in this regard? 2. Is report pulled on the basis of spends over 2L or on basis of PAN card? 1 – Suggest you to use your card judiciously. 2 – PAN number is the key parameter and based on which the data can be pulled out. In 2007 i earned 27 lakhs through a contract from essel group for which tds got deducted . An few weeks back i redeposited 20 lakhs in my acc which i earned in 2007 . Problem is i never filed it . Will i get a notice ? Dear Inder ..You may or may not. Suggest you to consult a CA and take expert advice. Things are changing very fast and Tax dept systems are more efficient now, so suggest you to file taxes (if any) on time without fail. My mother (80+ years old) is transferring Rs.12 Lakhs by cheque from her savings account in one bank to her savings account in another bank.in which the money will then be kept in Term deposits. Does these transactions come under the purview of A.I.R. ? She has never filed ITR as she was a housewife with no income and the money is inherited from my deceased father’s fixed deposits. This may not be listed in AIR, but the IT dept can get information about the Term deposits through CIB (Central Information Branch). Time deposit of Rs 1,00,000/- or more can be tracked. If her gross total income is below the basic exemption limit there is no need to file ITR. Income Tax Slabs & Rates for AY 2017-18. How to reply to non-filing of Income Tax Return notice? I ( 31 yrs old) purchased a 1 BHK flat in 2012 at price of 20 Lac (Registry value 12 Lac) on my father (65 yrs old) name in which I contributed 8 lac in cash & my father gives 12 lac in cheque to builder.Now today we plan to sell this flat at 30 lac & money distribution will be 15-15 lac to each so kindly advice me how this 15 lac shall receive in my bank account. Dear Gajanan..Has the property been registered jointly? Are both of you the co-owners of the property? No, Flat is on my fathers name only. If the property is being registered for Rs30 Lakh then your father can keep Rs 15 Lakh with him and the remaining Rs 15 Lakh, he can GIFT you. Kindly read: Gifts & Income Tax implications. Dear taimur..If you deposit and withdraw anything above Rs 50 Lakh, you banker may provide information about this transaction to the IT dept. So, make sure you keep the written documents (required docs) to prove that this is part of your business dealings. Suggest you to consult a CA and keep a track of all these kind of high value transactions. While my dad selling property I got a share of 7.5Lakh, and I am seeing this being listed under 26AS form under AIR section. Do I have to consider this amount while filling ITR? Dear Bindu..Has the property been gifted to you? If you have purchased it as a co-buyer, you need to calculate capital gains and has to check if any taxes have to be paid or not. I have bought a property worth of 20 Lakh, and managed this money from my dad. But this transaction is not yet listed in the 26AS as AIR. Let me know whether 20Lakh has been considered as for the while filling ITR, How to handle this case. If I have deposited or withdrawn say 1cr in a CURRENT ACCOUNT IN Fy 2015-2016 then will that be reported ? I mean this reporting of 50 Lac for current accounts is applicable from FY 2016-2017 ? Your bank may report about the transaction to the IT department. But do note that these new rules are effective from April 2016 only. my friend does a business and his customers used to stay in a location where they don’t have CITI bank , so they used to deposit amount in my SBI account and i used to transfer that to my friend CITI account via NEFT online.excluding his amount my transaction is less than 3 lakh but including his it’s 10 lakh transaction. my friend has paid income tax for that amount of his. but since that amount is reflected in my account too should i have to pay income tax ? if i don’t pay will i get a IT notice ? If i happen to get one what documents i need to solve the issue ?? Dear santhosh..Kindly dont repeat this. Yes, you may get compliance notice if there is a mismatch between your income filed in your ITR Vs transactions done with your bank. should I file returns now or wait for compliance notice and reply to it with necessary documents. If your interest income from deposits + income from any other sources is below Rs 2.5 Lakh, then no need to file your ITR. But kindly keep a track of your banking transactions. sir i sale my property in 14 lacs and take all the money in cash in march 5 2016.
what problem i will face in future please help me. Dear Hoon..It would be very difficult for you to invest the black money in financial products..But there won’t be any problem with the registered value, that is treated as white money. Sir, I had applied on my sons name ( he was a student in 2007 ist yr college ),in a govt hosing plot ( Tamil nadu husing board )like body. Its face value was 20 lacs, I paid 3 lacs initially . every year I was to pay ~2 lac. I had paid paid also. Now he is working for the past 3 yr. having ~ 20 lac income. I want to buy a flat of 100 lacs. & this fetches ~ 75 lacs.now -leaving 50 lac gain . But the plot is not yet transferred in his name as a balance of 3500 Rs only due form him. My son is not interested & hence wants to transfer to me by paying 5000 Rs ( the fee for blood relatives) The procedure being after this transfer it will be in my name , then after my paying 3500 rs It could be registered in may name thus the title will be will be recd only after this.Though this was not declared in my returns — could this be treated as bought out of my savings.? Dear Kumar..I am unable to understand your points. Suggest you to kindly consult a CA and get advice. Yes, the IT dept can issue a ‘compliance notice’ to you, asking for the ‘source of funds’ on this transaction. But as this is being done through banking channel, you can prove that this is a loan. Suggest you to make a loan agreement between your uncle & self. Hello…thanks for a wonderful article. I just wanted to know If I make a SIP in equity MFs of Rs. 25,000/- per month (total investment of Rs. 3lacs in a FY) across various AMCs then will I be susceptible for IT scrutiny ? Is the Rs. 2lacs investment in mutual funds applicable for investment in one particular house or all mutual fund houses combined ? Can u please clarify this point ? I believe that its in one fund house, in such a scenario that particular fund house (AMC) has to report this to the IT dept. I just wanted to know if I do SIP in equity MFs for Rs. 25,000/- p.m. (total invested amount coming to 3lacs in a FY) across different AMCs then am I susceptible for IT scrutiny ? what is this limit of 2 lacs investment in mutual funds ? is it for any particular mutual fund house or investments across various AMCs ? Can u please clarify in details ? I have received the notice from income tax regarding sold of immovable property values at Rs 30 lacs but sir I have received only 5 lac by cheques. I am 64 year old housewife and I have never return in earlier and now. Dear Molly..What is the ‘registered value’ of the property. My gross salary income is Rs.3 lakhs P.A, but my personal requirement purpose I used my credit card for Rs.1.50 Per month, 18 lakhs per annum. Every month used my credit card and then paid bill. it is any problem to me by credit card using. Please tell me. Dear Srinivasareddy..You may get ‘compliance notice’ from the IT dept. Dear HARI..Suggest you not to do that. Dear kumar..Kindly stop accepting such deposits. Encourage them to open bank accounts in their own names. Thanks for the valuable article. I have one query. If your income is below the basic exemption limit, filing your ITR is not compulsory. Yes, if you would like to file your ITR then you can do it online @ incometax-efiling website. Click here to calculate your tax liability (if any). I got a mismatch notice from Income Tax , regarding AIR , I sold a property on 13-14 financial year but also bought higher value property on the same year so didn’t mention gain in ITR. I am a salaried employee. 1)Can you suggest what should be the e-sahyog response ? 2)How important is this notice ? 3)What will be the action if I dont reply ? 4)What is scrutiny ? Is my case is a scrutiny ? 1 – Kindly read : All you need to know about eSahyog . 2/3/4 – It is very important that you reply to the notice enclosing all relevant proofs/documents. Kindly take the help of a CA. Thanks for the great article, very informative!! 2.) My parents can anytime give that money back to me and it would not attract any tax , right. 3.) I invest 30000 per month in my fathers name and same amount in my mothers name. I am currently doing this in cash. I have created a gift deed on a plain paper indicating the amount provided to parents in a financial year. My atm transactions also show the required cash withdrawl. Do you think its fine approach. 2 – Yes. (A gift is generally not returned. So you can consider this amount as a different one. Else it can be viewed as return of borrowed money ie loan). 3 – Legally (from taxation view point), it is fine. Kindly note that your parents may have to file ITRs (if required). I have submitted my ITR returns for AY 2014-2015 and 2015-2016 (Online – EVC accepted), which has refund for both the returns. Date of submission is 29-Jan-2015. Do I get my refund credit to my account? when will I get? Is there any last date for ITR return (AY 2014-2015 & 2015-2016), which I have missed? Dear shajahan..If your ITR is processed and is in line, you will get the refund directly credited to your bank account (to the bank account that is given in your ITR). Kindly check your ITRs status by visiting e-filing website. You can also contact IT helpdesk. IF I DEPOSIT 1,000,000 OR MORE IN CURRENT ACCOUNT IS THERE ANY PROBLEM….? ONLY CASH DEPOSITS ARE MONITOR OR WHAT…? IF I HAVE ONLY ONLY TRANSACTIONS THEN IS THERE ANY PROBLEM…? Dear Harsh..Yes it is cash deposits only. Also, any Cash deposits or withdrawals aggregating to Rs 50 lakh or more in a financial year in one or more Current Account of a person will have to be reported by the bank to the I-T authorities. Dear Harsh..This is subjective. If AO finds any discrepancy they may ask the tax assessee to submit compliance report. Sir I am a retailer having turnover more than 1 crore (44Ab applicable) deals with many customers in a day.If i received more than 2 lacs from many customers (just because i am a retailer) i have to file details regarding those customers in form 61A ? It is Very Difficult Task Please advise me what to do. Dear Pawan..I believe that this rule is applicable only for cash receipts. Good and valid point. Yes, if the income & investments/expenses are disproportionate then there can be a very high chance of getting a tax notice. Sir i am doing intrad day trading in my wife account. she is house wife. Now i have received notice from income tax departement that in the year FY 2012-13 contract of Rs. 10,00,000/- or more in commodities exchange and as per records you do not appear to file IT returns of AY 2013-14. Now what to do sir i have not filed the return as i was in loss i thought not to file the same. It is further to state that i am continuing trading in commodities with loss year on year but not filed IT returns. Now what are the options available for me. It is a serious issue..suggest you to take help of a Chartered Accountant at the earliest. Try to respond to the tax notice at the earliest. Sir i have already consulted with CA and he advised to since you cant file back date IT return, you have to file compliance stating that not filed ITR due to no taxable income. Yes, you can submit ‘compliance report’. Kindly get this done through your CA. You have to submit relevant supporting documents (if any).